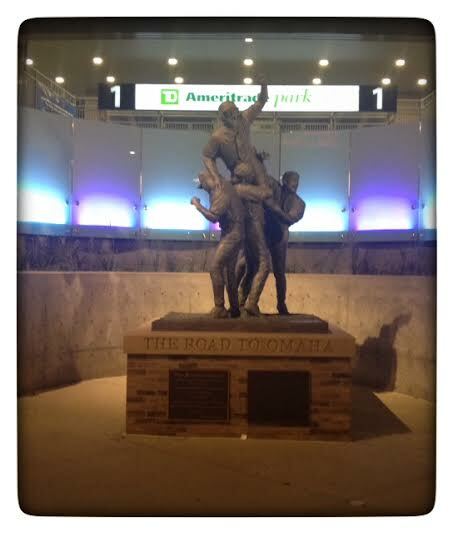 This is Part Two of my experience I had at the College World Series. If you didn’t read “Fish out of Water: Part One”, and want to begin at the beginning of this segment, click on the link above. Andy Kendeigh, Sports Director from KETV in Omaha and formerly of WISN in Milwaukee, was sitting at the table. I was telling him about the story that Trey Daerr did on me that was airing that night. He told me that FOX 6 Sports Reporter Tim Van Vooren was in town at a baseball tournament his son was playing in. He was going to try and catch up with him if he could. I felt like I was now “in the know” with a few local celebrities. Seriously though, I found all of this exciting. The reporters I have dealt with since this trip started have been wonderful. They may realize that they are local celebrities but almost all have been very respectful and have treated me very well. What I have realized is they all are under constant pressure and deadlines to get things done. As I learned out in North Dakota there aren’t many sports jobs but many people competing for position. Therefore, you have to bring your “A” game with you each and every day, or the business will eat you up. This is called the “churn”, new prospects coming in everyday. Just like in baseball, some can handle the pressure and some can’t. The guys I have met like Adam and Andy have these great personalities that invite you to feel good about what you are doing. You can count on them to put you in a good light as they are constantly perfecting their craft. Also, I admire the print media guys that I have met like Chris and Troy. These are the type of guys that have to come up with new and interesting material to build a story that will keep people reading their work. Since I have been writing every day for the last four months, I can tell you that it is very hard to do day in and day out. As I sat and “Geeked” the second game, I made sure to look around to see what all the reporters were doing specifically. Most, if not all, would make a note on particular plays during the game. Some would comment that “this is a big moment” (when the bases are loaded at any point in a game with no outs, it is safe to say that someone will say that in the press box). But, what blew me away was the research the guys were doing. Lots were on social media following something, others would “rifle” through three or four websites making a quick note. I overheard some radio guys, doing research for upcoming games, talk about the politics of the game, who was working for whom, who was under contract, etc. I guess I assumed that it was more glamorous than it actually is. Everyone is under pressure to preform. It truly is a “what have you done for me lately” profession. I don’t know if I would like that. I was enjoying my time in the Press Box and I have come up with a plethora of stories that I want to cover at some point in this journey. Things that the average fan I think would want to know, things that I want to know. 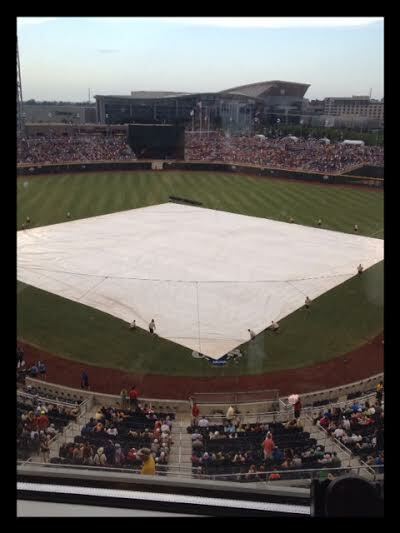 The second game between Ole Miss and Virginia went into a weather delay. I can say that I didn’t mind in the least bit. However, the regular sports reporters were not happy about it. I was getting a chance of a lifetime, and if I had to hang out in the Press Box Lounge rubbing elbows with other reporters, so be it (you like how I said “other” reporters). Plus, the guys who were calling the game for ESPN were less than ten feet and a wall away from me. I rode an elevator with ESPN’s Karl Ravech. I wanted to take a picture but thought better of it. I just looked down at my phone again and tried to cover up my Day Pass. As I was looking out the window and seeing how dark the clouds were, Jessica Mendoza came out of the ESPN room standing next to me, looking out the window and talking on the phone. I quickly snapped a picture of her but I wasn’t going to get a “selfie” with her, I knew better than that. I showed up three hours before the first game on Sunday. 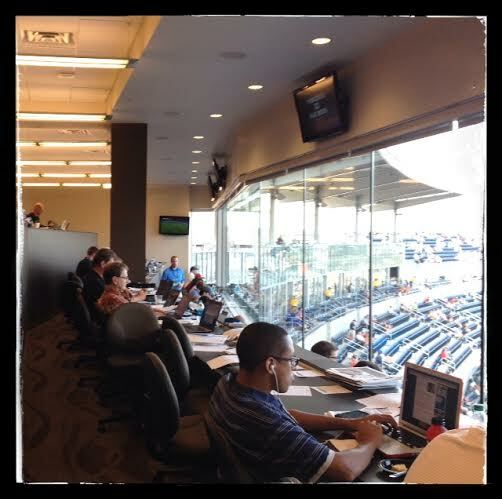 There was maybe one or two people there before me, but I was excited to spend another day in the Press Box. I wasn’t going to waste the opportunity (I had to wait until noon the day before to get the Pass; otherwise, I would have been very early that day, also.) I sat at the same seat and when the game started, I recognized the radio play-by-play guy who sat two seats away. I don’t know why he was there, but he was taking notes and the guys next to him were filling him in on different things. I think he will be calling the championship series for a different network. The two teams that I wanted to win lost on this day but it was a very exciting time! I went to both the Press Conferences. I now understand the protocol and hopefully won’t be too nervous the next time I get an opportunity. My only worry the entire second day was that I was going to be kicked out after the first game since it was just a continuation from the day before, but nobody said anything. I could go on about any number of things that I learned & experienced. I hope I get to more of this as I travel onward. I think I bring a unique perspective and now that I have one major event under my belt, I know a bunch of stories I will cover the next time! John you are acquiring some valuable information on this trip and experiences more than the average fan. Great job.